O ne of my personal favorites of all the Events of Holy Week in San Miguel de Allende is Viernes de Dolores, the Friday of Sorrows. This last Friday of Lent is when the Virgin of Sorrows is honored with beautiful altars in homes and public places. Look for them on windowsills, in niches, in doorways and living rooms, in public courtyards and private patios. The religious purpose of the day is to remember the Mother of Christ in her desolation as she sat at the foot of the cross watching her son die. Most images of the Virgin show her with tears on her face, her hands clasped at her breast. Sometimes she also has a sword through her heart. This day ushers in the events of Holy Week with a flurry of observations to come. One of the first things you'll probably notice today are the fountains. All of the more than 40 public fountains in town are cleaned and filled with fresh flowers, chamomile and fennel and decorated with cut paper in purple, white and gold foil. Then special altars start showing up in some of the public buildings and in the churches. Although this custom dates back to the Spanish colonial times of the 1600s, today it is unique to the state of Guanajuato and the Bajío region—just another reason to be glad you're in San Miguel for all the events of Holy Week. For me the highlight of this day is an evening stroll through the cobblestoned streets of San Miguel to see the altars in homes. They range from small, humble but heartfelt memorials sitting on a windowsill to elaborate creations that fill an entire room. 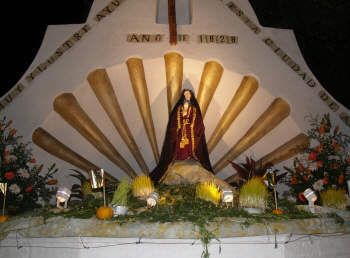 Hundreds of people walk up and down the sidewalks and streets, stopping to admire the altars through the open windows and often to enjoy treats handed out by homeowners—fruit drinks, candies, ice cream, nuts and candied chilacayote, a kind of squash that has been served on this day for nearly 300 years—one of the very traditional events of Holy Week. In some of these homes, all the furniture has been removed from the main living room, the sala, with a window facing the street. The whole family has worked for hours, or even days, painstakingly creating the altar, often adding entire street scenes and villages at the Virgin's feet. Though the details may differ from house to house, there are standard elements that grace all these Holy Week altars. In the center, always, is an image of the Virgin—usually a statue but sometimes a painting or banner. She is surrounded by large white candles and flags or drapes in purple—the color of grief and mourning—and white—for her purity. Bitter oranges represent her sorrow; chamomile stands for her humility; and gold foil represent the Virgin's joy in the knowledge that her son will be reborn. Fennel stands for the betrayal and abandonment of Jesus by his disciples. There are also pots of pale, almost colorless, wheat grass. It is grown without light to keep it a pale yellow. After it is brought out, it begins to turn bright green over the coming days, signifying the renewal of life and resurrection. Sometimes, the altars continue onto the floor with elaborate designs and symbols, often pre-Hispanic, rendered in flower petals, seeds, coffee beans, chamomile and sawdust. One of the most spectacular altars in town can be seen at Zacateros 59, the home of the Ledesma Hernández family. It features a pair of statues that are close to 200 years old. The huge, four-tiered altar includes a large painting of the Last Supper, a painted canvas sky, boulders made of wire and cardboard, an elaborate sawdust carpet and live music. Another very special and traditional altar is that of the Pérez Robledo family at Aldama 46. The altar has been put up every year since the family first arrived in San Miguel more than 125 years ago. Today, it's continued by the third and fourth generations, who also continue the tradition of handing out ice cream and fruit drinks to passers-by. The Dobarganes family altar at Correo 25, and the Pérez Bautista family altar at the corner of Mesones and Reloj are also very worth visiting. Finally the patio of XESQ, the San Miguel radio station, always has a fine altar at Sollano #4.
Insider's Tip: One of the best neighborhoods for seeing home altars is along Calle Barranca, and you'll find hundreds of sanmiguelenses strolling the street until well after midnight. Do visit the altars in homes on this night. 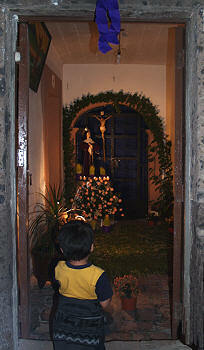 It's the perfect entry into the spirit of all the events of Holy Week in San Miguel de Allende. It's also a lovely way to spend the evening and a revealing look into the heart of Mexican culture. 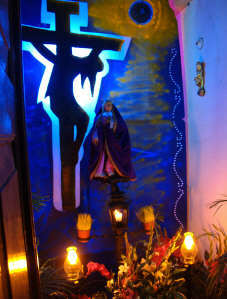 NOTE: For Semana Santa 2012, Viernes de Dolores, the Day of the Altars in Homes, falls on Friday, March 30th.